For a series with such great characters and great visual design, Mass Effect has sadly been neglected on the action figure front, DC Unlimited only just releasing its first line of Mass Effect 2 figures in April 2011. Even then, those are pretty hit-and-miss, some fine detail on Grunt let down by Shepard's train wreck of a face. 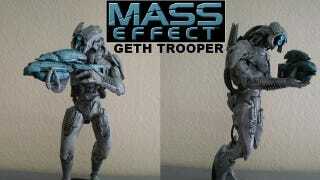 This custom Geth figure, by toysmith pyramidhead22, gets it right. The detail, the scale, and it's even fully posable, having been crafted from the remains of some Halo toys (and even the legs of the Tali figure).